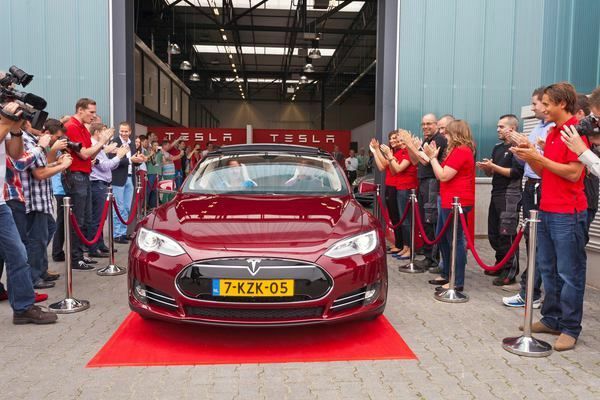 Tesla Motors is beginning to deliver the Tesla Model S in Europe, which means that their warehouse, assembly, and distribution center, in Tilburg, Netherlands, has opened. On Thursday, the company released a picture of that facility, saying that Model S deliveries to Dutch, Belgian, French and German Model S customers have now started. The first European delivery occurred in Norway two weeks ago. Back in December 2012, Tesla told us about this assembly facility in Tilburg. How it works is that semi-finished Model S's leave the factory in Fremont, and are shipped to Tilburg, as is a bunch of parts. The parts are to serve as a stock of replacement parts for repairs, as well as to support final assembly of the Model S. The European Model S has some differences from the American model, because the company strategy is to localize the car to suit each region. The 62,000 square foot (18,900 square meters) facility in Tilburg, a small city located near Rotterdam, is meant to to allow for timely and cost effective operations throughout Europe. Over time the facility will support vehicle importing operations, final vehicle assembly and distribution, service headquarters, technical training operations, parts remanufacturing, collision repair and more. The location means Tesla has access to the huge port in Rotterdam, as well as excellent rail facilities. Back in December, Tesla said general production of European left-hand drive Model S was planned to begin in March 2013. Between then and now cars were being shipped to Europe, with final assembly and checks being performed in Europe. While at the opening of the Supercharger station at the Fremont factory, I learned that a large portion of the recent Model S production is being shipped to Europe and that U.S. deliveries have slowed as a result. The delivery team in Europe is being trained right now in Tesla's delivery process. Bryan Batista, Tesla Sales Director Europe, said: "It's very exciting to see our cars arriving in Europe and being welcomed by their proud owners here in Tilburg. This location is pivotal to Tesla's European operations, which are expanding rapidly over the coming months with openings of around 15 new stores and service centres."